Sushi in my book is edible art. While I think all cooking is an art form in itself, there’s something remarkable about sushi. The way it is prepared, served and meant to be enjoyed slowly is ceremonious. It’s the kind of food that instantly puts me in a good mood. While the term sushi is ambiguous and somewhat loosely used, for me it encompasses a certain flavor and taste and I take liberties with it. When the lovely owner of St. Jude Tuna reached out to me about working together again, I was delighted. I don’t believe in product pushing and I’m not interested in just throwing anything at my readers and hoping it sticks. But truthfully when I believe in something, I get pretty excited about it and want to shout it from the roof top or my blog page in this case. This time the request was for me to create something with their smoked tuna. Wait a minute, what? I’ve had smoked salmon before but honestly never got my hands on canned smoked tuna so this was a new venture. I could sit here and tell you that just simply eating it out of the can would be pretty damn delicious but I wanted to give you something a little more creative. Recipe testing was adventurous and messy and while I had a vision of what I wanted to make, I had to fine tune it along the way. Before the package even arrived, I was set on some form of spicy tuna sushi roll. The combination of creamy salty, spicy and smokey flavors sounded pretty great. The caveat with this recipe was that it had to be paleo and Whole 30, which of course works for me. But while paleo is sometimes flexible with rice, Whole 30 is not and grains are strictly off the table. And traditional sushi is well, made with rice. But fear not as in comes cauliflower rice to the rescue. Also, if you’re not whole 30, feel free to use regular sriracha but if you’re strict, you can find Wildbrine sugar free sriracha. I played around with making a sushi roll with the spicy tuna but frankly I wanted more. My vision was a pile of vegetables and lots of flavor so I decided to scrap the roll and just go with the bowl. This would give me the liberty to create exactly what I envisioned. A tuna sushi bowl makes for a perfect lunch or dinner. This recipe and photo collection is by Daniella Modesto @calmeats. Beautiful!!! For rice: If you’re not whole 30 or paleo, feel free to use regular rice. But otherwise, combine all ingredients under rice and set aside. For spicy mayo: Combine all ingredients under spicy mayo in a small bowl and set aside. For smoked spicy tuna: In medium mixing bowl break up the tuna with a fork until flaky. Add the rest of ingredients and mix well. To assemble: Layer the rice on the bottom of the serving bowl. Add tuna and vegetables in any fashion you wish and drizzle with spicy mayo and top with toasted sesame seeds. Joe and I have been so fortunate to meet Daniela Modesto with Calm Eats. She has created a beautiful recipe for our Good Food Award winning Mediterranean canned albacore. This recipe is Whole 30 and Paleo . Calm Eats St. Jude tuna cakes with blackberry and peach salsa. In medium bowl, add lemon juice, 2 tbsp extra virgin olive oil, salt and pepper and whisk well until the dressing is thick. Add peach pieces, pepper, onion and cilantro and stir well. Last, add the blackberries but gently toss them around. They will discolor the peaches a bit but don’t stress, it’s supposed to happen. Once all the ingredients are mixed well, cover the bowl and set aside. Combine all ingredients under tuna cakes in large bowl and form into 6 patties. Preheat frying pan over medium high heat. Add olive oil to pan and slowly add tuna cakes in one layer. Cook tuna cakes for 3-4 minutes per side until golden. Once tuna cakes are done, you can let them rest of a paper towel lined plate for a minute then serve with blackberry peach salsa. Tuna is the third most popular seafood in the U.S., behind only shrimp and salmon. Most of what we eat being the canned variety. Since all of those cans begin to blur together in store aisles, we’re highlighting a few names and places to make it easier for you to pick an ocean-healthy option off of the shelf. St. Jude Tuna is packed in its own juices or the olive oil pack. that contains 210 calories, 24.5 grams of protein 12.25 grams of healthy fat. Available without salt!! St. Jude Tuna trolls for their albacore. Common Albacore vs. Troll-Caught Albacore Common canned albacore or “white meat” tuna, the kind found on supermarket shelves, comes from tropical Pacific waters. During processing, nearly all the fat is lost. Common canned albacore is almost fat-free, but has very little omega-3 fatty acids. In contrast, Pacific troll-caught albacore, ST. Jude Albacore are younger fish from colder, northern waters. Troll-caught albacore are handled to retain their fat with all its healthful omega-3s. That’s why troll-caught albacore tastes juicy and rich and has all the health benefits of these special omega-3 fatty acids. Common Albacore vs. Troll-Caught Albacore Common canned albacore or “white meat” tuna, the kind found on supermarket shelves, comes from tropical Pacific waters. During processing, nearly all the fat is lost. Common canned albacore is almost fat-free, but has very little omega-3 fatty acids. In contrast, Pacific troll-caught albacore are younger fish from colder, northern waters. Troll-caught albacore are handled to retain their fat with all its healthful omega-3s. That’s why troll-caught albacore tastes juicy and rich and has all of the health benefits of these special omega-3 fatty acids. Panzanella [pantsaˈnɛlla] or panmolle [pamˈmɔlle] is a Tuscan salad of bread and tomatoes that is popular in the summer. It includes chunks of soaked stale bread and tomatoes, sometimes also onions and basil, dressed with olive oil and vinegar. It is also popular in other parts of central Italy. 1 6oz. 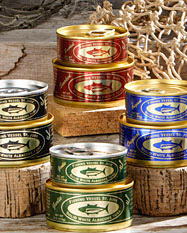 can of St. Jude Mediterranean canned tuna!! To prepare vinaigrette, combine first 6 ingredients; stir with a whisk. To prepare salad, combine cucumber and next 7 ingredients (cucumber through tuna) in a large bowl. Add bread. Drizzle with vinaigrette; toss gently to combine. It is getting harder and harder to stand out of the tuna crowd with good quality troll caught albacore tuna. Starkist has come along with a new brand that looks like it is nestled in the cute little harbor of Garibaldi Oregon. It is a big farce. These tuna are from Chinese and Fijian Longliners. They say that is is MSC certified, but I do not see any documentation on how this fishery could be possibly sustainable when there is so much by- catch in longlining for albacore tuna. Longlining for albacore is not sustainable. Blue Harbor says their albacore is sustainable because the MSC has certified them. “The port used in the marketing for Starkist’s new boutique US brand, which uses albacore caught by Chinese and Fijian longliners and is on sale in Walmart, is in Oregon, according to multiple sources in the tuna business. According to sources in the US tuna sector, the photo on the website of the Blue Harbor Seafood Co., the new Marine Stewardship Council (MSC)-endorsed, boutique brand from Starkist, is of Garibaldi, Oregon. The port authority did not respond to a request for comment from Undercurrent News, however. Dongwon Industries-owned Starkist, which eventually confirmed its ownership of the brand after request for comment from Undercurrent, did not respond to clarification on why an Oregon port and US fishing vessels are being used to market a brand using albacore caught by foreign longliners. A spokeswoman for Walmart declined to comment on the use of American imagery on the brand’s website. Bellevue Washington: St Jude Tuna has been named a finalist in the prestigious 2017 Good Food Awards. The awards are designed to represent not just the best of America’s growing food movement, but the best of America. The fishing vessel and its crew emphasize sustainability from deck to table. The St. Jude participates exclusively in the troll fishery for albacore, with highly targeted- minimal impact on the ocean’s food chain. None of the fish we catch is wasted. The family-owned company conducts regular testing to monitor mercury levels. The company, based in Bellevue, Washington, has being selling its tuna locally since 1998. Representing 14 categories and 38 states, all finalists rose to the top in a blind tasting of the 2,059 entries from nearly every state and passed a rigorous vetting to confirm they met specific Good Food Awards standards around environmentally sound agriculture practices, good animal husbandry, sourcing transparency and responsible relationships throughout the supply chain. Other Washington State finalists in the fish category include Ekone Oyster Company and Deckhand Seafoods. The Good Food Awards celebrate the kind of food we all want to eat: tasty, authentic and responsible. Now in its seventh year, awards will be given to winners in 14 categories: beer, charcuterie, cheese, chocolate, cider, coffee, confections, fish, honey, oils, pantry, pickles, preserves and spirits. The Good Food Awards Seal, found on winning products, assures consumers they have found something exceptionally delicious that also supports sustainability and social good. Good Food Award Winners will be announced Jan 20, 2017, in San Francisco. The Good Food Awards, organized by the Good Food Foundation 501 (c) 3, are proudly supported by the Good Food Retailers Collaborative, the Presenting Sponsor for three years running. Composed of 21 of the country’s top independently owned retailers from Austin to Oakland to Salt Lake City, they are committed to supporting America’s great food producers in their own communities and across the country. “Eco-minded Seattleites love St. Jude’s sustainable fish albacore tuna products. Owned and operated by Joe and Joyce Malley, the couple trolls solely for Albacore tuna in the North and South Pacific aboard their 95-foot fishing vessel St. Jude. They lived aboard the fishing vessel for 12 years until they decided to have kids and market their catch. St. Jude’s impact on the ocean is minimal; they employ targeting trolling techniques, which cuts way down on the catch of other species. “In my personal experience in thousands of hours trolling, we never had a marine mammal encounter, we never killed a shark, we once gave a thrill ride to a three pound green turtle when he got tangled up with a jig line but he was released uninjured after we took a few pictures,” writes Joe. This is one of Chef Custer’s favorite quick and easy recipes. She eats it plain and says, on grain bread with watercress, it’s the ultimate picnic or boating sandwich. Try it as a terrific open-face canapé or serve as an albacore cocktail in a pretty glass layered with delicious greens. With a fork, flake the two cans of tuna with juice into a medium bowl. Add the remaining ingredients and stir to combine. Season with black pepper. Best if it sits a day before serving. Makes 2 cups of salad, 4-6 sandwiches, 16 canapés or 4 cocktails.